The Voyage to South Georgia was one of the most adventurous that I have taken in my life. What an experience. Departing from Port Stanley at midday on Monday we arrived in the wee small hours of Friday. The first three days were pretty monotonous to the point where the only thing that we could find excitement in was watching the sea temperature slowly decrease. It’s gone from ten at Stanley to two degrees here is S. Georgia. 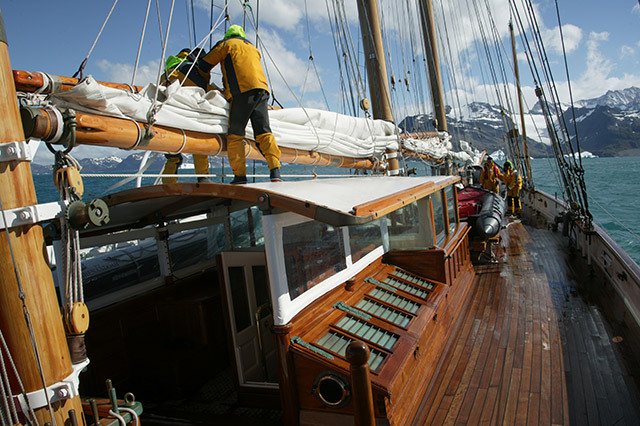 The journey itself was quite efficient with very favourable winds and bearable sea conditions. 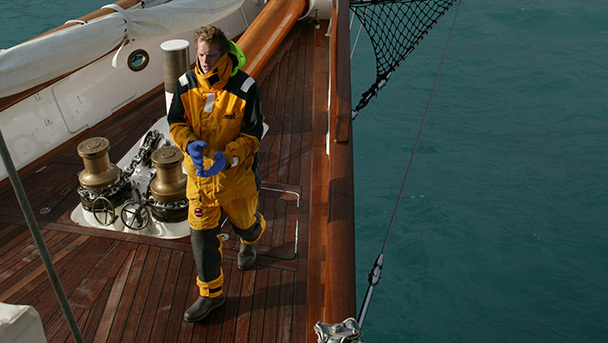 At one point we averaged twelve knots over a six hours period, which is pretty good going for a 360-ton ship purely under the power of the wind. Things started to get interesting on the fourth day when we received a satellite photo of the southern Ocean around S. Georgia. On it there were three icebergs, two to the southwest who’s area was actually greater than that of S. Georgia and one to the north east at half the size. Let me put this into perspective. 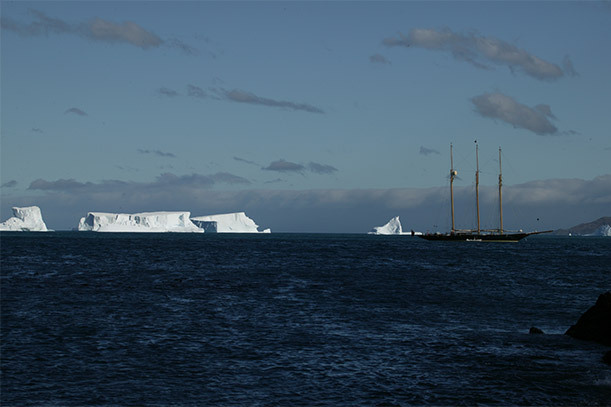 A floating piece of ice moving around in accordance with the winds and current, forty miles long of which only one fifth is above the water, the area of which is size of the Isle of White. Fortunately we were not going anywhere near the bergs but as we approached S. Georgia we started to see the effects of them. As night fell on Wednesday a few targets started to appear on the radar. They were not ships. If fact we have not seen another ship at sea since we left Argentina three weeks ago. These targets were pieces of ice that had broken off from the larger bergs. At first there was just a few that did not coincide with our course but as we progressed so did the number of bergs until the radar screen looked like it had a serious case of measles. I would guess at worst there were over a hundred bergs in a 24-mile radius. It felt like we were doing slalom in the southern ocean (the most dangerous in the world) with bergs similar to that which sank the Titanic, very surreal. What made it even more entertaining was that dispersed amongst the large tabular bergs there were small conspicuous cheeky little bergs just as likely to sink the ship as the large ones. The tension was high on deck but the atmosphere one of amazement for wherever you looked you were surrounded by uniquely beautiful sculptured bergs with opaque ghost like floating mannerisms that demanded respect for they were the rulers, the gatekeepers to the island of our destination. Like tanks lined up ready for battle one after another they floated by with us keeping a watchful eye. This lasted throughout the day then started to ease off as we got closer to S. Georgia. Along our passage through the bergs we spotted thousands of seals that seamed to slip through the water with ease occasionally popping their heads up like aquatic Meercat’s curious about the ship that was passing them. 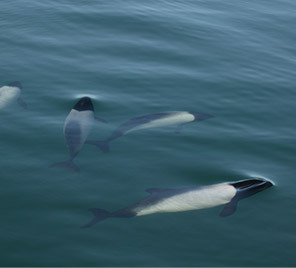 The other treat that we saw were two Humpback Whales, which came alongside the ship then dived under the hull lifting their tales poetically in the air as if to wave goodbye then disappeared into the abyss. 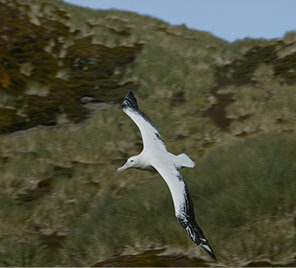 The sky to was full of life, the most impressive of all being the Wandering Albatross, the largest bird on the planet. With their commanding presence in the air these birds looked like giant living gliders, hardly ever flapping their wings to gain height they just use the breeze and pressure of the wind against the sea for lift. Watching these birds elegantly swooping to and fro with such freedom and style was breathtaking. As we began our approach to Grytviken on Friday, dawn was breaking but not to the reassurance of sunlight but to the claustrophobia of sea fog. At times the visibility was down to less than a hundred metres and with the previous days iceberg fiasco this meant that again we had some cautious and careful navigation to carry out. With only thirty five miles to run we meticulously picked our way through the fog to see the sight of land. As the terrain started to become more defined its fantasy put the whole crew in a state of ore. Mountains over three thousand metres high surrounded by glacier leading into the sea with an inhospitable landscape and almost vertical gradient mystically appearing through the fog was something I will surely never forget. 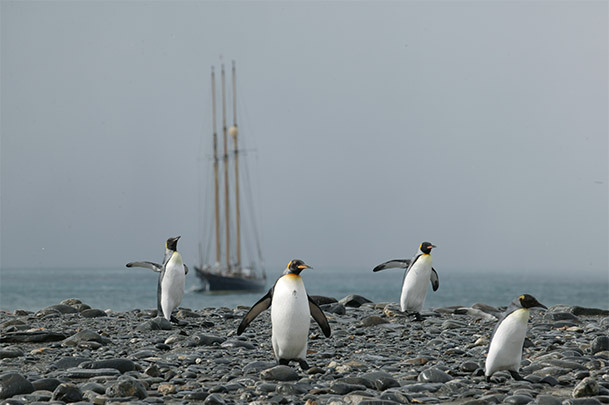 We handed sail and started engines then rounded up into a little bay called Cumberland Bay, where the old Whaling Station used to be and now is the home of the British Antarctic Survey. Dropping the anchor we all had the relief and gratification of arriving in a country far from civilisation, a land full of unremitting beauty and a place so abundant and diverse with wildlife that wherever you look you see nature going about its business the way that evolution has dictated. This is now going to be our home for the next few days as we are expecting some extreme weather to pass by this weekend. It is far from what you would call home but I’m happy to call it that for at our grasp is an opportunity to explore a natural wonderland, a land untouched by mankind, and with it, the beauty that accompanies. I am truly unable to explain South Georgia’s splendour to do it justice, it is a place like none other, a different planet within ours, a land that no picture can portray. I feel blessed.